This practical U.K. handbook, for all members of the health care team, shows through extensive use of examples and checklists how the clinical governance imperatives can be addressed and achieved in order to deliver quality patient-focused health care. Section 2: Developing and Implementing Best Practice - Developing best practice, Problem identification. Finding and selecting the evidence. Audit - the beginning and the end of the change cycle. Section 3: Accountability and Risk - Accountability and professional self-regulation. 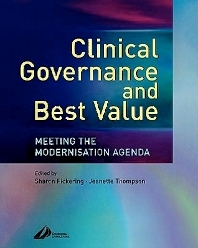 Risk andclinical governance: restoring confidence in health and social care . Section 4: Structured Approaches to Care Delivery - Structured care and clinical governance. Integrated care pathways. Evaluating and adapting practice guidelines for local use: a conceptual framework. Section 5: Organisational Culture and the Change Agenda - Organisational culture. Achieving change. Towards sustainable change and improvement.